*SANDY SANDY ART*: The Fall Giveaway's Pot Has Been Sweetened! In my last post, the kittens and I announced our Fall Giveaway. Although the response to it has been OK, I really want to make it even better. I've sweetened the pot - (to bribe someone in order to receive a favor). I'm now offering the winner of this giveaway their choice of one of these featured original watercolors in addition to the bat prints! 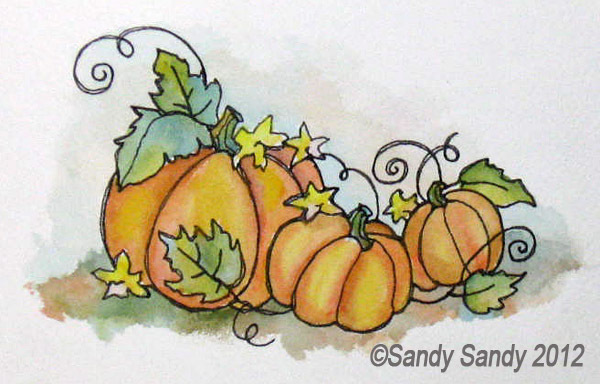 Original Watercolor - Fall Pumpkins - matted 5" x 7"
You can read the rules for entering here. 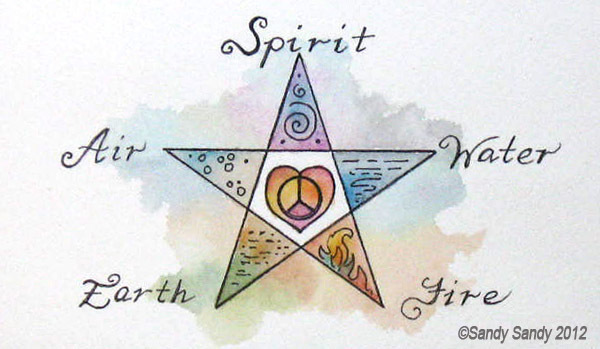 Original Watercolor - Pentagram - matted 5" x 7"
Each time someone links to this giveaway on their blog, they get two more entries! And each time they comment on one of my posts from now until September 30th, they get another entry. I've made a list and I'm keeping track, so be sure to send me a link if you post on your blog. 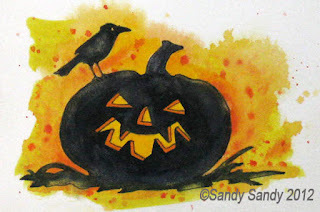 Original Watercolor - Crow and Friend #1 - matted 5" x 7"
This crow and pumpkin painting came about today because I have a crow and pumpkin theme starting to take shape this year in my kitchen. Original Watercolor - Crow and Friends #2 - matted 5" x 7"
I hope to hear from you all. Please let me know which watercolor you would like to own if you win and I'll write it down by your name! as if it could not be, as if it had not been!" Ooh Wow! They are all so great!! 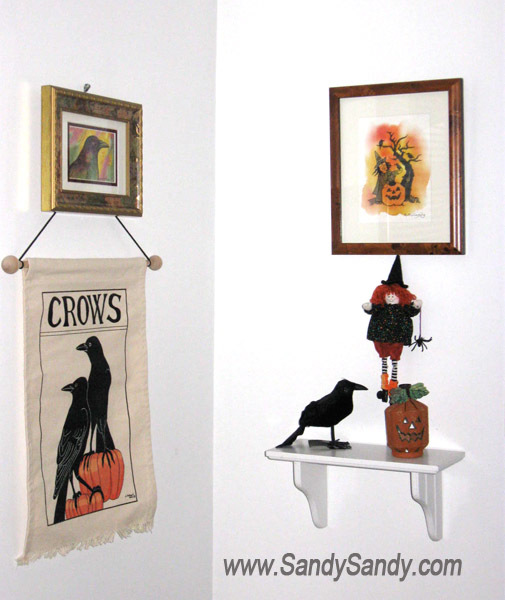 I must admit, though, I am partial to the Crow and Friends #2!!! I will annouce your wonderful giveaway on both my Wiccan Life and Witch Cats blogs! You need not bribe me, I would gladly do it! Thanks so much, Kim!! I went by and commented on your posts. THANK YOU & GOOD LUCK! These are all such colorful and attractive designs! Mary, I really appreciate your kind words! THANK YOU!! These are fab! Please enter me! I've shared on FB, google +, and my blog! And, extra thanks to Witch Cat Blog for helping me find my way here! It's really nice to meet you here! Thanks so much for following and sharing my giveaway! Best Wishes!! You're in! Oh, boy you are really going all out for your giveaway. Anyone lucky enough to win any of your stunning paintings is going to be soooooo happy!.. I love the pumpkin crow theme going on; I bet your kitchen is looking pretty impressive! Hey, and thanks for the shout out too. I have used our "niece and nephew with white pumpkin" as my desk top image for the last week or so (the photo you took of Princess Cutie Pye and Opie assisting in setting up the giveaway) It makes me smile everytime I open the computer. Their brother and sister are jealous, lol! And don't even get me started about the dogs! Hey Robin, thanks for the shout and your never ending kindness! You are most welcome for mine! (* There's 8 entries in the hat for you now!) Feel free to use any of the pics I post of your niece and nephew on your own blogs as well! As always, thanks so much for everything, my dear!! Love the sketches Please enter me in contest. Thanks. 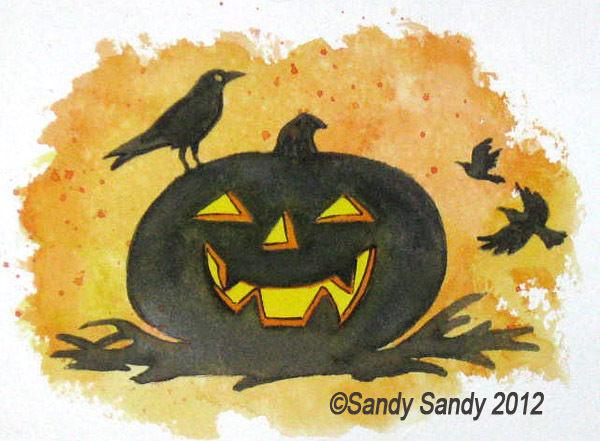 All right, you wild and wonderful Halloween freak - I'm glad I am not the only obsessive painter around here! :) :) I LOVE all your Halloween art and designs. Please enter me; I'd love to have these in my living room and bedroom!